What is it about Van Gogh? 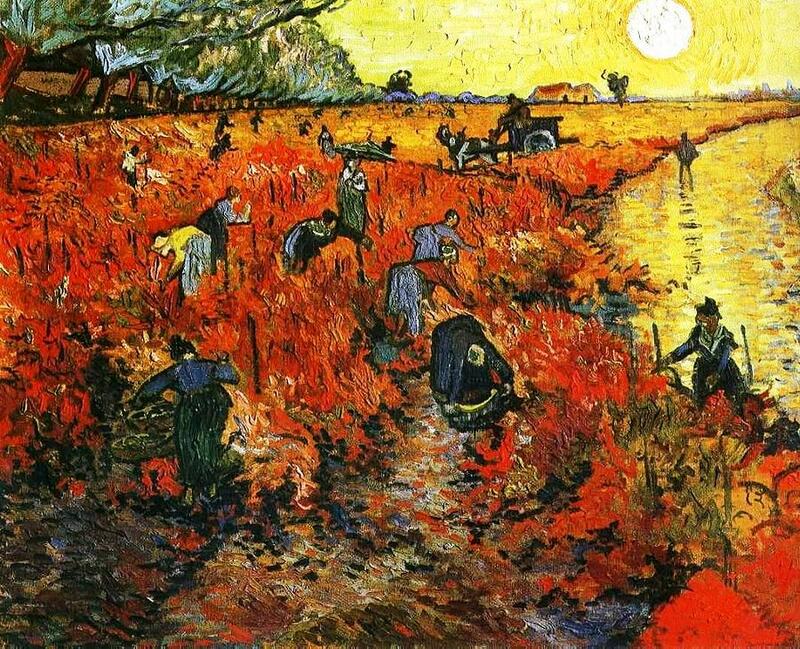 Out of Vincent Van Gogh’s 900+ paintings, “Red Vineyard” (pictured here) is the only painting that sold in his lifetime. Here is a man who painted because he was compelled to do so. Not for money, fame or even the respect of his peers. He painted for the sheer joy and drive of the act of painting itself. That is what is so intriguing to me about Van Gogh. I recently visited the Met, and I surprised myself by wanting to locate Van Gogh’s work before any other artist. Not because I think he was an amazing artist, but I think he had the heart of an artist. I felt a connection the more I read about his life and work. He went against the accepted techniques and subjects of his day. He shamefully didn’t hide his brushstrokes when it was expected that the most skilled artists create as smooth a painting as possible. He painted ordinary objects when his fellow artists only painted what was beautiful. He painted the way he thought he should paint not based on his sales or the opinions of others. His work was shocking and undesirable but he kept on painting. Perhaps this is why his work is sought after, today. He was a radical with a brush. This entry was posted in Art History, Artists, Paintings and tagged Art History, artist spotlight. Bookmark the permalink. Enjoyable post. Van Gogh’s charisma is mysterious to me too. But Knowing something about his life I agree, the best part may be “the heart of an artist”. And the humility that allows what is in the heart to show itself. Definitely in all the later paintings. Thank you. Thank you, Carol. It was strange to me this weekend as I was drawn to look for his paintings at the Met – even before Sargent!! (gasp) So I had to do a little analyzing of myself. I’ve never been interested or impressed with his work before I started to learn about him. What a strong connection that human element can be. Honestly I find that usually what makes people interested in my art is knowing me. And not other things I thought were more important. Duh!